Did you discover mold growing in your home or business and are unsure about the severity of the infestation? If you need help handling the damage and odor caused by mold growth in Stafford, Fredericksburg, or Woodbridge, call the mold removal professionals at 911 Restoration of Northern Virginia for same-day service. 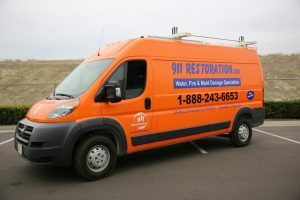 Property owners in Stafford can call 911 Restoration of Northern Virginia 24/7/365 to get help from experienced mold remediation technicians. You can count on us to arrive at your property within 45 minutes of an emergency call. 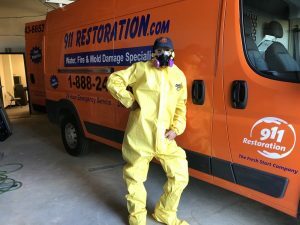 911 Restoration of Northern Virginia has the safety equipment and professional training to properly handle mold remediation. Let us return your home or business to perfect condition starting today. You can reach out to us to get the dedicated support you need to get a Fresh Start after a mold infestation. Mold infestations can occur for a number of reasons in Stafford, Woodbridge, and Fredericksburg. Sometimes, mold begins to grow after you experience water damage. Leaking pipes, floods, and other water damage emergencies introduce excess moisture to your property, which can allow mold to thrive. Mold spores may also enter your property through your air conditioning system. You can even carry in mold spores on your clothing. Regardless of how mold enters your property, 911 Restoration of Northern Virginia can get it out again. You can count on our IICRC certified mold removal technicians to take charge of any mold infestation. We have the resources to handle both commercial and residential mold removal effectively. All 911 Restoration of Northern Virginia techs are licensed, bonded, and insured to handle mold cleanup. Our years of experience allow us to quickly and effectively take care of any type of mold infestation. Techs can even handle black mold to return your property to perfect condition. Get your peace of mind back after a mold infestation by contacting the pros at 911 Restoration of Northern Virginia today. Let us focus on returning your property to better-than-new condition right away. Mold remediation can bring your home or business back to perfect condition after a mold infestation. The techs at 911 Restoration of Northern Virginia will work tirelessly to clean up and restore your home or business. We understand the causes of mold infestations and techs will take steps to protect you from future infestations. 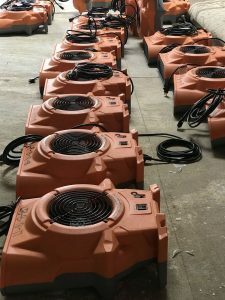 You can rely on us to dry and dehumidify your home or business to make it harder for mold to grow and spread. The techs at 911 Restoration of Northern Virginia can also use infrared scanners to locate hidden spots of mold growth. Ensuring that total mold decontamination occurs can limit the odds that you will have to face additional mold infestations. Mold cleanup is a process 911 Restoration of Northern Virginia takes seriously. Let us focus on odor removal along with all repair and renovation work. You deserve help from a company that takes handles mold infestations every day. 911 Restoration of Northern Virginia is a locally owned and operated mold removal company armed with cutting-edge restoration equipment. Techs utilize safety equipment, air blowers, air filters, scanners, and more to ensure that mold remediation is carried out quickly and effectively. Let us handle all aspects of the mold restoration process for you. We will be focused on your peace of mind from your mold inspection until the job is completed. Take the first step to completely restoring your home or business by calling us right now.